Woodbury Safari Lodge Trophy Room displaying over 50 South Pacific & North American species including two Sheep Grand Slams. Woodbury Safari Lodge is situated in the beautiful province of South Canterbury on the South Island of New Zealand, about 90 minutes drive south of Christchurch Airport. The lodge is set on 10 acres, in a private enclave of native Totara trees, on the south bank of the Waihi river. The town of Geraldine (population 3000) is a short drive away and offers all the services required including excellent cafes, restaurants & banks. This location is a huge advantage for our trophy hunting business, as we are not situated up a remote mountain valley on a ranch (which means that likely you have to hunt the same property every day). This location also allows us to offer outstanding non-hunter activities and tour options. Each day we are able to choose our hunt destination depending on the weather and species desired. On any one day, hunters at the lodge may be out hunting on several different areas for Stag, Tahr, Chamois, Fallow etc, while non-hunters explore the local sights and shopping. The lodge is base of operations for Fraser Safaris New Zealand. 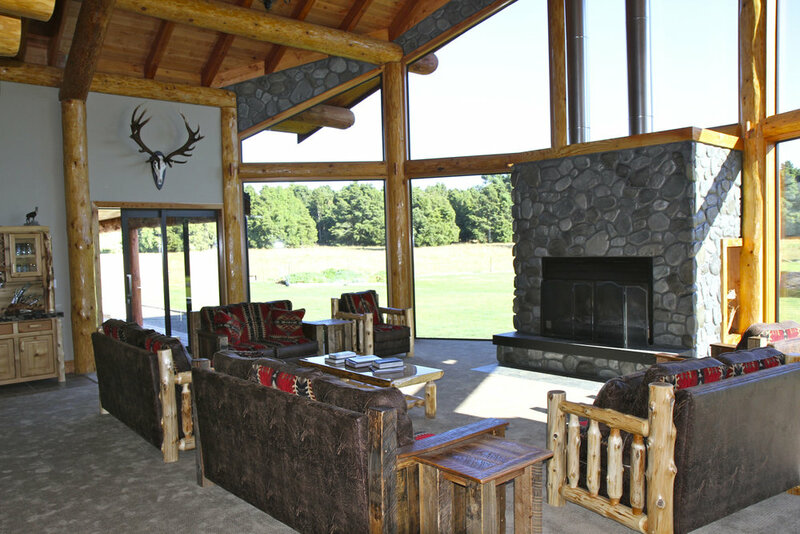 Woodbury Safari Lodge represents the new standard for hunting lodges in New Zealand. Spacious luxury comfort for single hunters, couples, families & groups. All meals & soft drinks provided. Each bedroom opens onto the sunny spacious hardwood deck. The lodge is one level (wheelchairs OK) except for a large loft area in the trophy room which is setup with a large screen TV & surround sound. Facilities include free wireless network, guest laundry, private bar, kitchen open to guests & rooms serviced daily.